Consolidated Credit held its first annual scholarship program this year, offering students across Canada a chance to participate and enter to receive a $1,000 scholarship. “We saw this as a great opportunity to help students struggling with debt and aimed to help with the costs of higher education like tuition and books” said Jeff Schwartz, Executive Director at Consolidated Credit. “In an ideal world, everyone would have a great paying career waiting for them after they are finished their post-secondary education so they could easily pay off their student loans. But in reality, several graduates have difficulty finding work, leading to struggles with their monthly loan repayments. Student Debt is a serious problem in this country as more and more students are graduating with increasingly large debt loads so we wanted to help students struggling with payments” says Schwartz. We received essays from students from universities and colleges all across Canada on topics related to money saving tips for students and how they plan on paying off their student loan. There were some excellent and creative tips on how students can be frugal to save money and some great plans on how students are going to be using their loans responsively to help pay off their loans. The essays were publicly shared on the student’s blogs so they can be easily accessed and enjoyed by others as well. Our panel of judges went through the essays and would like to announce Christine Streeter from Carleton University, Ottawa as the inaugural recipient for this year’s award. Christine stated in her essay that she enjoys using budgeting apps like Mint to help create and stick to a budget, she like to meal prep to save on food costs, go thrift shopping and take advantage of student discounts wherever she can. All great tips for students living on a budget, but applicable to everyone else too. 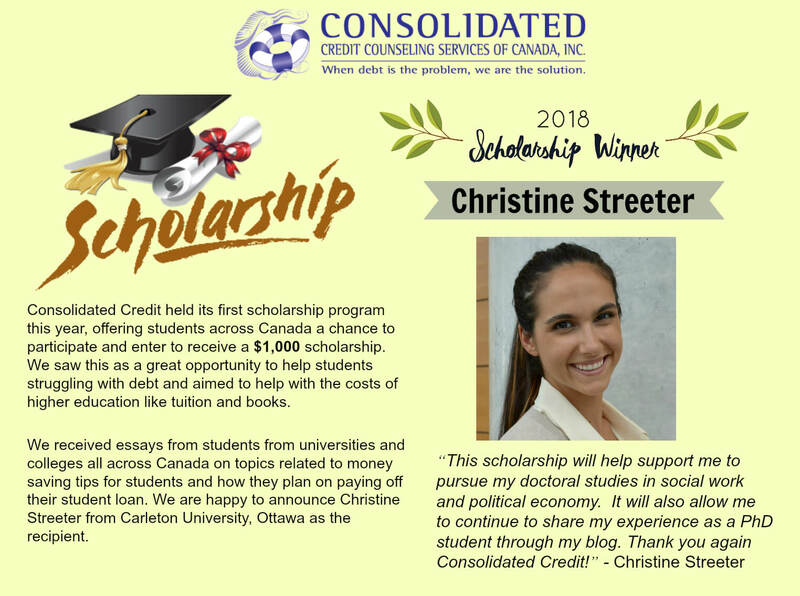 “I am very grateful and honoured to be chosen as the recipient of the 2018 Consolidated Credit Counseling Services of Canada, Scholarship Award!” said Christine. We would like to thank all participants for entering the scholarship and sharing their tips on how students can save money and use as well as pay off their student loans wisely.